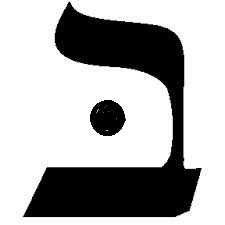 The Hebrew letter Beth shows a three-sided enclosure open on the north side, the direction the sun moves toward summer solstice in the northern hemisphere. Hence, this area is exposed in the direction of longer days, greater light, the path to illumination (as opposed to the south, the way of obscurity). A center point occupies this house of enlightenment. Who is this? Who is at home in the house of light? The story of Creation begins with this letter. “Bereishit (In the beginning) God created the heavens and the earth." In the house that God built, who dwells? Who is the one that enters and departs through the north door? He is head of the household. We are his guests. The properly oriented half-dome, providing shade when the sun is at zenith and maximum illumination as it descends, is a recurring motif in the late visionary architect Paolo Soleri's notional mega-structures, which he called "arcologies" - an attempt at imagining a new form of architecture which would bring urbanism into better balance with the landscape. Besides providing a trope for 'mean streets' science fiction, Soleri was able to set in motion a (some would say) quixotic pilot project in northern Arizona called ARCOSANTI which is still ongoing. Thanks, Jaime, for calling our attention to this transcendental architecture. Look at Arcosanti! A campsite of wandering angels bedding down in the terrene world after their meteoric flight out of the empyrean! This is the radiance from the house of light flying headlong into the dark of the phenomenal world. With these sublime arches and circular portals, they convey countenance and tidings from the Head of the Household! Only God knows where they are going as they cast shadows on earth of proud and audacious geometries from a higher order!